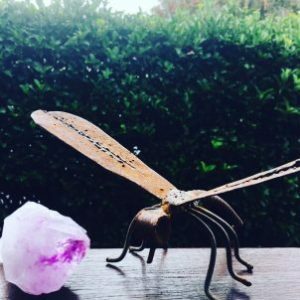 On the first day of 2017 a Dragonfly once again flew into my life, this is the second time the Dragonfly has entered my life & by no coincidence it was in 2008 a number 1 year, the beginning of a new cycle of 9 as it is today in 2017. It didn’t matter how much I resisted & how hard I tried to keep my life exactly as it was, change was already in motion & in 2008 my life as I knew it would never be the same. Little did I know then that the Dragonfly is symbolic for transformation & change so with that in mind may you allow the wisdom of the Dragonfly to transform your life with adaptability & grace, may the Dragonfly bring lightness & joy to you & your loved ones as you embrace all the new beginnings 2017 holds. Wow 2017! The year of new beginnings! New beginnings simply mean let go and change. So if you felt like in 2016 what you wanted didn’t come around fast enough or you found yourself thinking that it’s time to let go of things or people that no longer fit into your alignment, it’s because you were getting ready for all the new beginnings 2017 has in store for you. 2017 is all about individuality, taking the initiative and making all those important decisions you know you’ve been thinking about but haven’t quite put all the pieces together yet. This is exciting knowing that 2017 a number one year offers you powerful energy for change a chance to start again, start fresh, whether it’s small or large, your health, your career or within your, relationships, change is already in motion all you have to do is run with it. This is a year where everything and anything can shift, all can present as fresh and new. My best advice is whatever it is you need to change don’t fight it. As you may have already experienced change can sometimes be scary, it’s the unknown that we’re often afraid of, we tend to hang onto things or people that we know no longer serve us but there’s familiarity and comfort, even if we know it’s not working it’s what we identify with. So if you’re in need of a push this year, you may find yourself swept up like a feather caught in a wind storm and at times wondering whether you’ll ever see the light again. Don’t be afraid, let go of fear… because the answer is yes, you will if you allow yourself to let go of what you know you have to, everything will become lighter, brighter and more enriched than you could of ever imagined. It’s all up to you. Are You ready for change? Are you ready for excitement and adventure? Are you ready to take responsibility for your life? And most importantly are you ready to regain or enhance your personal power? if your answer is YES but you’re unsure where to start, holistic kinesiology can help you identify any blocks you may or may not be aware of, it can help you let go of what needs to go, allowing you to step into your true power with love.